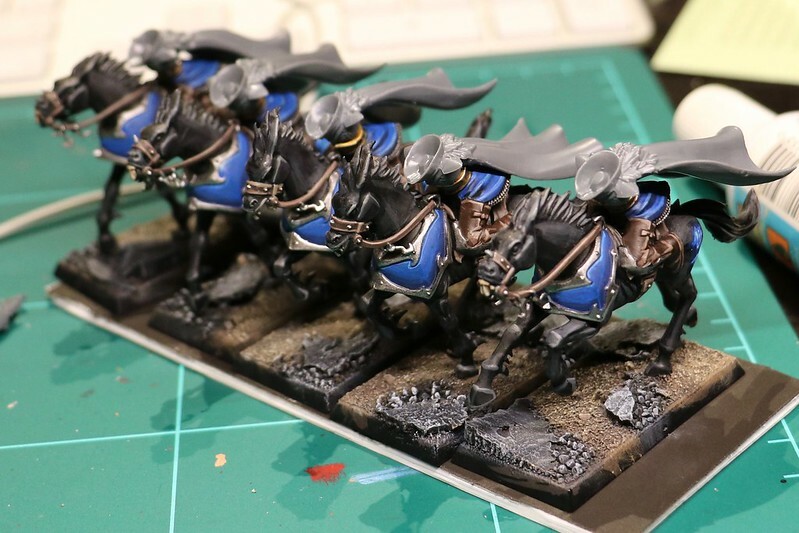 WIP of the magnets on the riders. WIP of the dark rider. I took a black cloak, with the most gentle blending I could come up with. Although the colour scheme looks a bit monotone, I quite like the model as a whole. It looks dark.. for dark rider. I could try a brighter cloak, either by adding grey or a dark colour, but I'm worried I'd break the main theme too much by adding a clear colour. Perhaps a reddish brown? If I don't come up with something better, I'll stick with black. Looks fine - very nice! Looking good. You could probably break up the cloak a bit by adding a thin blue line across the bottom? Some of the cloaks are still drying from their final wash. The rider in the middle of the front line is the one I completed on Monday. I really dig the smooth blending and dark style, although I can't say it's a very exciting colour scheme. Still, they would fit the theme of the army well. I could add a blue line, I suppose, but I fear that it might copy the feathers too much (which uses exactly that). Perhaps a white line would work as well? It might make a subtle difference with the horse, which have been highlighted with bleached bone, or palid wych flesh in the end. I wonder if I should give the feathers a blue wash to give them a dark, subtle blue shine the way a raven's feathers work. Loving the black cloaks, they really pop! May I ask how you accomplish such a good effect? 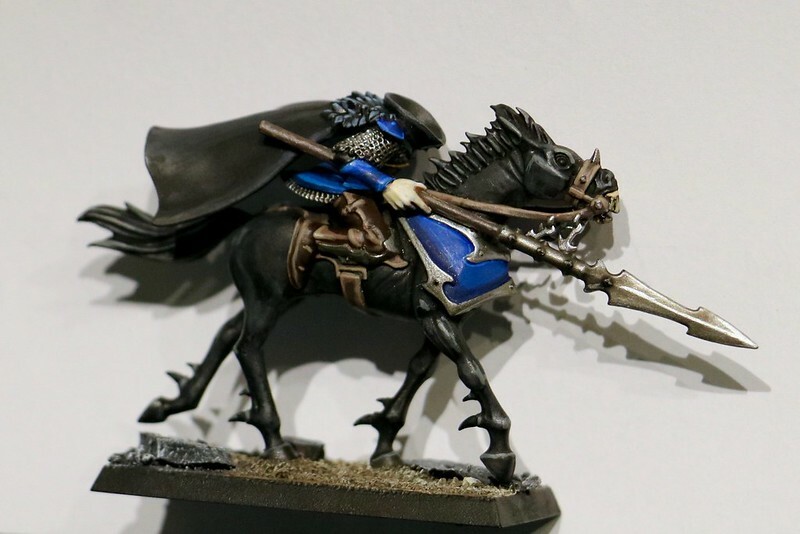 I've been struggling to make black work for my army. For the black, what I did is basecoat it in black (silly but important) then give a very diluted wash of a dark grey. I suppose diluting it with Medium would give better results, but I because of the quantity needed I use water. Then I apply that very very diluted coating in dozens of thin layers. It goes fast since it's mostly water and seems to dry almost as fast as you apply it. For the horse, I simply continued and then added a yellowish white highlight, either a bone or palid wych flesh will do. 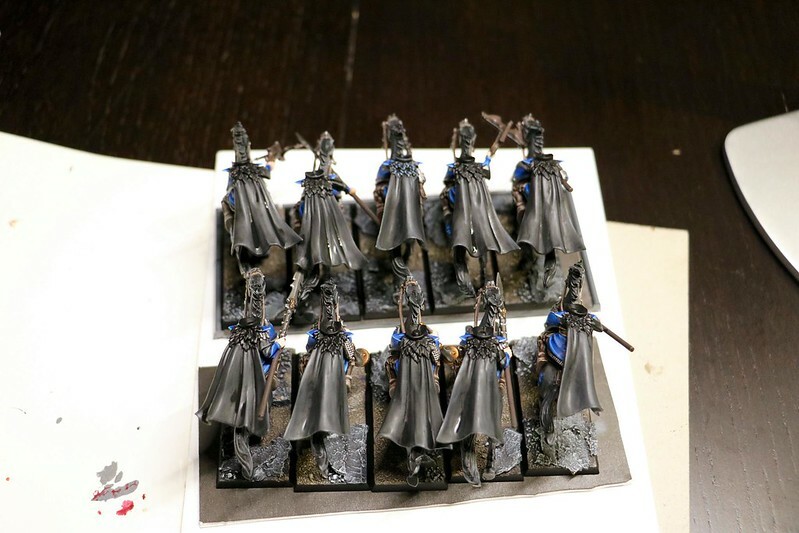 For the cloak, I wanted them darker so I applied a medium thinned black wash, and then darkened whatever regions I wanted even darker with diluted black. For the leather cloak I just did, it was even easier. Basecoat steel legion drab. Then a careful (no pooling!) brown wash over the entire cloak. Then darken only the recesses with multiple washes. By using thin layers, it goes fast and there isn't a lot of drying time. I did use one thin layer or black shade to speed up the darkening and reduce the colour saturation a little, but that was basically it. 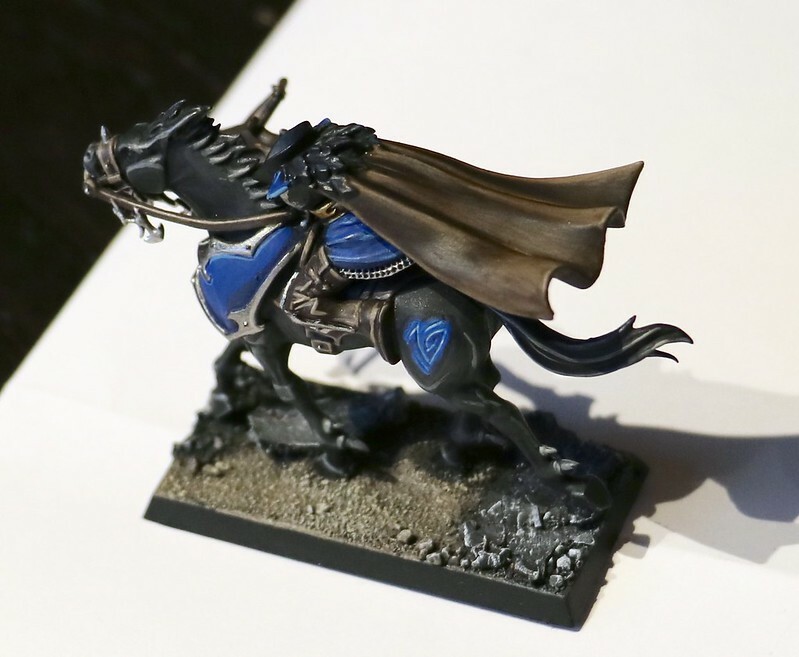 it looks very nice - but IMO Dark riders should be black. But if you are worried about the unit looking to mono tone than that works well!